Sam's Yams Bichon Fries are made from 100% sweet potato and cut like French fries. Perfect for smaller dog breeds as a chew, or a treat for larger dogs. Can be used as a training treat. All Sam's Yams dog chews are particularly well suited for senior dogs whose teeth and gums are more sensitive. 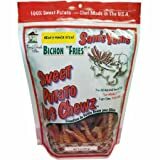 Sam's Yams are totally digestible and an excellent nutritional chew, far superior to many other healthy dog treats in any nutritional comparison. Sam's Yams products contain no wheat gluten (a common dog allergen) or other additives. Veterinarians recommend our product because it is hypo-allergenic. Made in the USA.